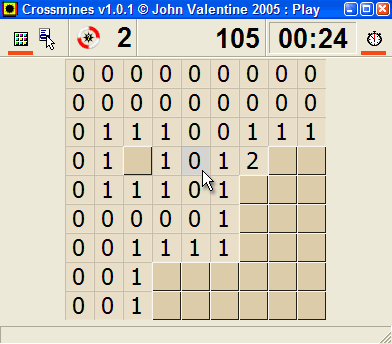 After starting Crossmines, you will see the high score table. At first there will be no scores, because you have played no games. When you have played a few games, the table will fill up with your scores. Click on the 'New Game' button at the top-left of the window. This opens the 'New Game' box, where you can choose the type of game you want to play. In the 'New Game' box, you choose the type of game you want to play. This starts a new game. Identify all the cells that contain mines, without activating any of them. Do this by testing cells, or marking them as containing a mine. Hover your mouse pointer over a cell - the cell under your pointer will pulse white. Left-click to test the cell. 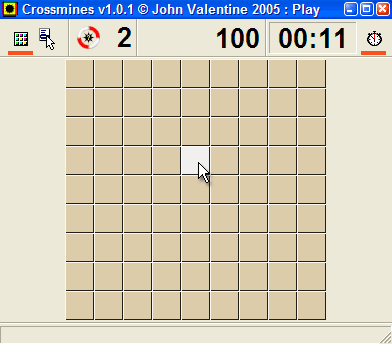 Game over - You trip the minefield! * This happens when you test a cell that has a mine within. Numbers are revealed. Each number tells you how many mines are surrounding a cell. 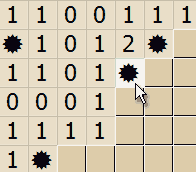 You can use this information to work out where the mines are hidden. * Your first test is generous: if you trip a mine on your first test, it will not trip the minefield - instead, the cell will be marked. With one cell tested, numbers are revealed (when you test a 'zero' cell, exploration happens automatically when it is safe to do so, and many numbers are revealed). Right-click to mark a cell. 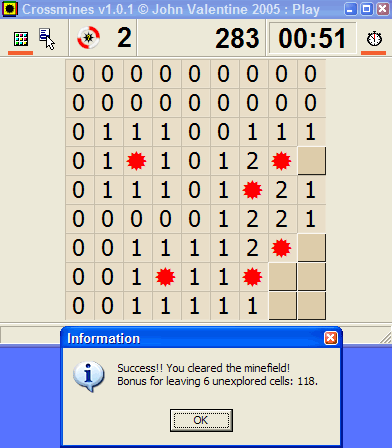 In this example, the marked cells are those where a '1' implies that its only unexplored adjacent cell contains a mine. Continue until all mines are identified.